This lesson was an exercise in finding airports and entering the patterns. We went to three different airports with landings at each. Leaving Waukegan, we flew north to Racine. 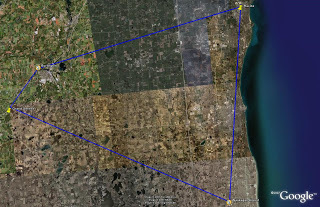 I coordinated with the Kenosha tower to transition through their airspace along the way. I had the right frequencies set before takeoff so the transition went smoothly. There was no traffic in the pattern at Racine so, we picked runway 4 to give us a crosswind. I landed without any trouble then taxied back to depart for stop number two. Burlington was the second airport and, again, I got the right frequencies set in before takeoff. I also put KBUU in the GPS but I didn’t really need it. I saw the airport from well out and got in the pattern for runway 11. There was very little crosswind on this runway and it was another good landing. Another taxi back, set the radios for the next stop and take off again. Out last airport for this flight was Grand Geneva. It is only 6 miles from Burlington so everything happened fast. Still, I found the airport and made the radio calls without any problem at all. My approach was good but, I didn’t hold the crosswind correction all the way to touchdown. The wind was light so it wasn’t a problem but, this was the only landing that gave Sandy something to criticize. Before leaving C02, I set up the radios and GPS for home. Right after takeoff, Sandy turned off the GPS to simulate a failure. I used pilotage and familiarity with the area to stay on course and get back home. I think that Sandy’s main goal with this flight was to again feel confident sending me away from the airport solo. It must have worked since my homework is to plan my long solo cross country. That gets me back to where I was before my two month layoff.